Spectacular glaciers, ancient forests, snow-capped mountains and miles of stunning golden beaches—it’s all happening just over the ditch in New Zealand. Explore the enchanted landscapes and make sure to check off these top 20 nature encounters. The Milford Sounds has been named the 8th Wonder of the World and all we can say is: believe the hype. Its stunning landscapes will make you think you’re inside a postcard and that’s why it gets half a million visitors each year. You can walk, kayak, and drive but cruising is an unforgettable experience. Glide across the deep inky waters surrounded by rainforest and vast mountains and get right up close to the cascading waterfalls. Keep an eye out for penguins and pods of dolphins. The windswept Moeraki Beach in North Otago is famed for its perfectly rounded stone balls. The striking rock formations, some of which are two metres high, were formed millions of years ago and spill across the soft sand. According to Maori legend, they are the ancient remains of sunken Araiteuru canoe. It’s bags of fun to jump from boulder to boulder and soak up one of New Zealand's extraordinary wonders. Steamy orange-lined springs located in Wai-O-Tapu just outside of Rotorua are a fiery natural sight. Formed 700 years ago by a hydrothermal eruption, the pools are bright orange due to sulphur, mercury, gold and silver deposits. The surface temperature reaches 74 C and its carbon dioxide levels means bubbles rise to the surface, hence the name, Champagne Pools. 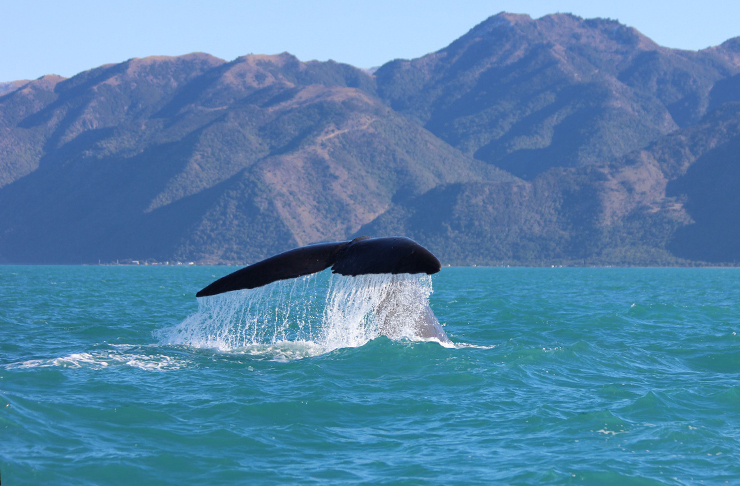 For up close encounters with wildlife, head to the pretty peninsula town of Kaikoura in the South Island. Spot dolphins, fur seals, and albatross but hang out for what everyone comes to see. The world’s largest toothed predator, the Giant Sperm Whale. It's a majestic sight. Nestled amongst beech and podocarp forest in Wanaka’s Mount Aspiring National Park is magical pools of pure glacial water. Take the swing bridge over the Makarora River to the viewing platform and see the icy blue depths. You can surrender to a moment of total tranquility. 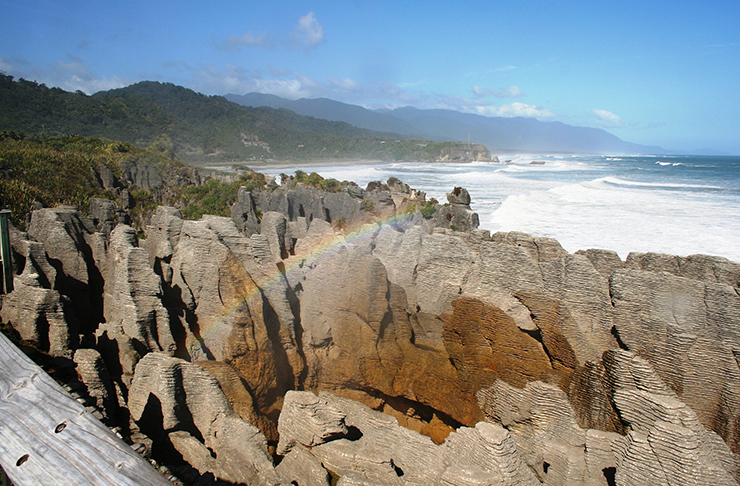 Take in Punakaiki's famous Pancake Rocks at Dolomite Point in the South Island. The labyrinth of limestone is a natural wonder made up of hundreds of slices of stone that really do look like—you guessed it—pancakes. Stick around for the magic at high tide, when the seawater geysers put on a water show for a dramatic and spectacular sight. You can find glowworms all over New Zealand, even in backyards, but the most spectacular views are in a cave. Board a boat on the Waitomo River and drift through the underground limestone caves which are illuminated with thousands of tiny glowworms. These spectacular formations are stunningly lit and its serene beauty is unforgettable. Known as an ultimate surfing mecca, Raglan Beach is the ultimate paradise for lovers of the sea. If you know your waves, then don your wetsuit and hang ten at this epic spot. But if the rough waters aren't your thing then explore this rugged west coast beauty by horse trekking or hiking up the Mt Karioi track to the summit. You will be rewarded with breathtaking coastline views. 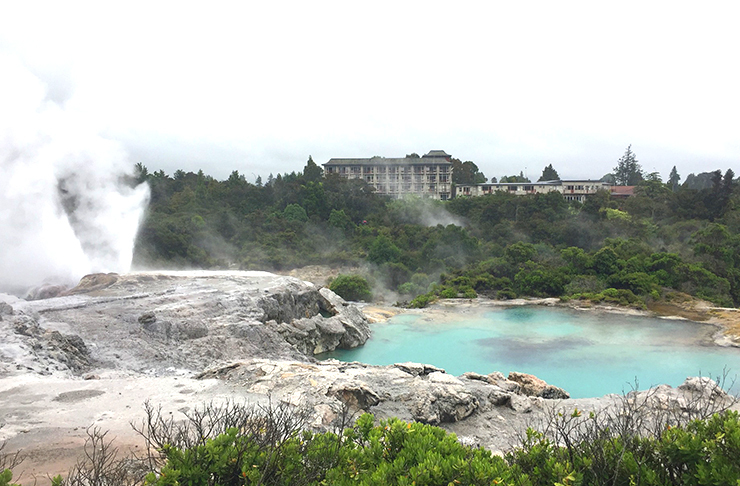 Picture Rotorua and it’s hard not to think of geothermal wonders that dot the area—and the rich smell of sulphite. Boiling mud pools, hissing geysers and volcanic craters, the place is well and truly cooking. Take a walking tour to explore the hot stuff and soak in the steaming springs. While you're in Rotorua, Redwoods Forest is home to 5600 hectares of native bush and a magnificent stand of California Coastal Redwoods. Stroll amongst these ancient giants on the suspension bridge walk to get a unique bird's eye view. The short trek is made of 23 bridges up to 12-metres high in the air. The wonder of a waterfall is a nature encounter you can’t help but get lost in. New Zealand is home to countless breathtaking falls where turquoise waters gush across the native bush. The Purakaunui Falls, located in the stunning Catlins region, is just one and is truly an iconic spot. Just like a wedding cake, the cascading waterfall has three tiers of greatness and can be gazed upon all day. For a complete encounter of beach paradise, Abel Tasman is your ticket. The coastline is one golden stunner after another. The 53km track can be walked entirely over three to five days with huts to stay along the way. One particular standout is Anchorage Beach for its breathtaking beauty and turquoise waters. Stay overnight in the campsite and make sure to schedule a side trip to the magical Cleopatra pool nearby. It really wouldn't be a list of nature encounters in New Zealand without a little bit of thrill seeking. Snowplow down Cardrona in the South Island, which has the most reliable snow conditions in the region. It’s the perfect place for beginner skiers and snowboarders. While you’re near Wanaka, pit-stop at Waterfall Creek to enjoy the waters of sparkling sapphire reflecting the nearby snow-capped mountain ranges. A sunrise hike up Mount Eden would be worth any early morning wake up call. This dormant volcano rises high 650 feet above sea level, delivers a priceless panorama of views across all of Auckland. Savour the solitude at the summit and peer into the deep sloping crater at your feet and scan the landscape for the sky tower and one tree hill. 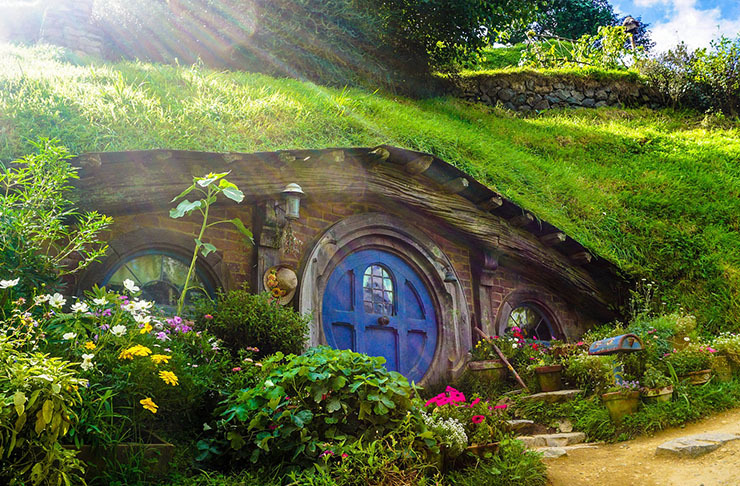 Follow in the fuzzy footsteps of J.R.R Tolkien’s hobbits at Hobbiton in Matamata. This vast set of 12 mossy acres is where Peter Jacksons Lord of the Rings Trilogy and The Hobbit came to life. Wander through brightly painted munchkin home village and take a photo outside the famous circular front doors. Take a trip to Gore, and expect it to be rather...fishy. Upon arrival, street signs declare you have arrived in the world capital of brown trout. There’s even a sculpture of a huge fish between the main street and the Mataura River—the world famous brown trout stream. Here, stand in the clear stream with Mount Cook in the background and cast your fly wide in the hopes of hooking a slimy beauty. 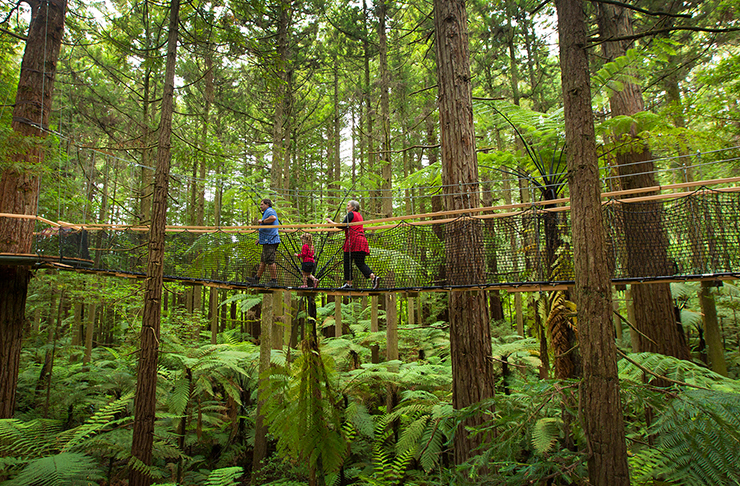 The West Coast Treetop Walk over the Hokitika Gorge is far from your average stroll in the park. Gather your courage and make your way up to the steel gantry that is 20m above the forest floor. Look down over the vivid turquoise water that seems to glow with its own light surrounded by native bush. Find yourself on the top of the world on the breathtaking ice fields of Franz Josef Glacier. Get dropped off by helicopter mid-way up and then hike to the top with experienced ice climbers exploring the maze of crevasses and peaks on the ice. The blue-white landscape and sheer enormity of the glacier is staggering. The magical Cathedral Cove boasts a spectacular naturally-formed archway, making it one of New Zealand’s most photographed spots. But its ultimate claim to fame is a starring role in the film Narnia. The cove is reached by a winding path through native bush, taxi boat from Hahei beach or by kayak. A highly recommended option given the surrounding pristine waters and marine life you can encounter. Explore the tranquil island bird sanctuary that is Kapiti Island and chances are, you'll see a little spotted kiwi. The seemingly uninhabited island is just one hour’s drive north of Wellington and is one of New Zealand’s top nature reserves. It’s famous for its native flora and fauna and its encounters with wildlife. Scoot on over and walking take a tour of this predator-free paradise. Want More? Check out all our ahhhmazing travel stories here.